Actress Moon Chae-won will star in the upcoming fantasy rom-com “Gyeryong Fairy Tale” as an age-defying fairy, which is scheduled to air Nov. 5. The new tvN series is based on the famous Korean webtoon series of the same title and features a main character played by Moon, a fairy who has spent 699 years waiting for her husband and becomes a barista in the modern world. The show walks a fine line between fantasy and reality, with the main characters having extraordinary ability and an interesting background -- such as Kim Geum, who can communicate with animals and plants. “You can watch the show till the end without feeling stressed. You can tune in whenever and (the show) will still flow smoothly,” the actress said during a press conference Tuesday. Moon said she was “honored” to star alongside veteran actress Go Doo-shim, who shares the leading role as Sun Ok-nam. 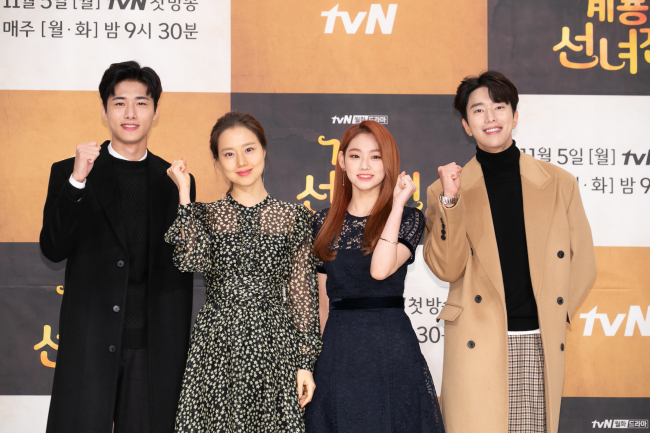 Director Kim Yun-cheol said he was attracted to the webtoon series because it dealt with themes such as dreams and love, and added that he wanted to approach what could have been a rather heavy story with humor and wit. While the show will focus on human relations like the original webtoon series, Kim also said CG animals featured on the show -- including a talking cat -- will be some of the cutest viewers have seen, which months of work have gone into. Actress Kang Mi-na said she’d watched videos of tigers and cats so as to best play her character Jum Soon-yi, the daughter of Sun Ok-nam and a tiger that takes the form of a human being. Kang, who is starring in a drama series for the first time, thanked Moon for giving her guidance on the set, while Moon said she felt comfortable working with Kang. The 16-episode show will air every Monday and Tuesday night at 9:30 p.m.